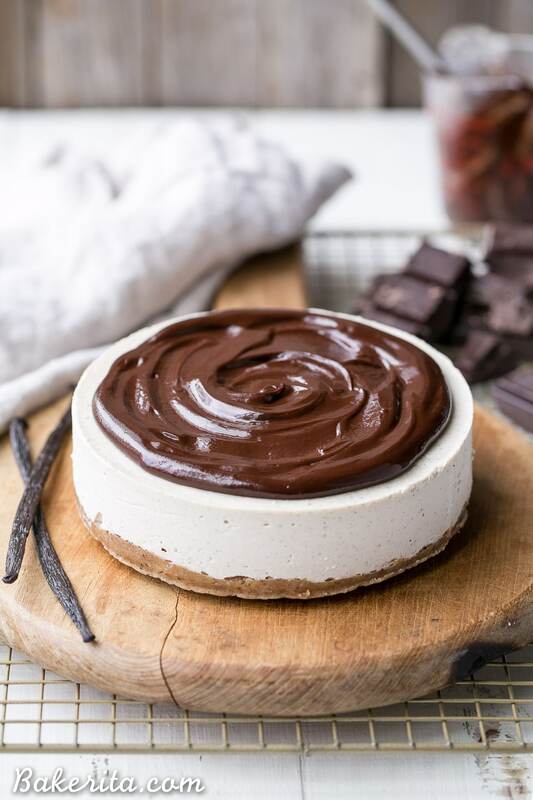 This No-Bake Vanilla Bean Cheesecake with Chocolate Ganache is a gluten-free, Paleo and vegan cheesecake made with a walnut crust, a creamy cashew cheesecake filling, topped with a luscious chocolate ganache. This healthier cheesecake alternative will satisfy your cheesecake cravings! 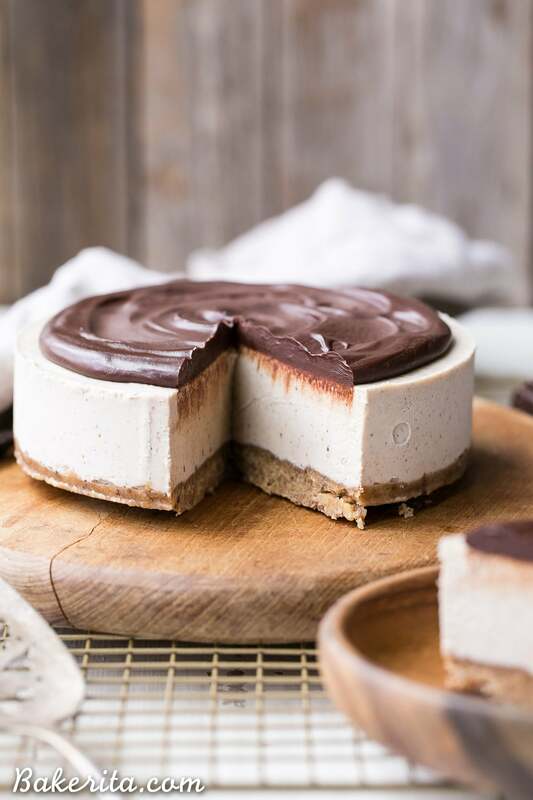 I’ve been on a cashew cheesecake kick lately – I can’t seem to get enough of them, and I’m constantly impressed by the lusciously smooth and creamy filling that results after a few minutes whizzing in the blender. It’s kind of amazing, isn’t it? Cashews, after being soaked in cold water overnight, transform into the most magically smooth and creamy paste, ready to take on any flavors you’re adding to it. When they’re blended up with some coconut milk, coconut oil, and maple syrup, the cashews somehow become even richer. A splash of lemon juice in the mix adds the tang we’re all looking for in our cheesecakes. The hearty dose of vanilla bean is warm and comforting, flavor’s version of a bear hug. When I put the cashews used in this vanilla bean cheesecake in the water to soak, I was undecided as to which flavor of cashew cheesecake they were going to be made into. I had three flavors in mind, and took to Instagram Stories to poll my Instafriends to see which flavor was the most wanted. Of the options, vanilla bean with chocolate ganache won with flying colors. Strawberry and mango, the other flavor options, weren’t too far behind – meaning those flavors have got to be made soon, too. Can’t disappoint anyone ;) and let’s be honest: I’m dying to eat them. But back to the vanilla bean: you guys wanted classic, and I’m here to deliver. Vanilla bean is underrated, and here, it really shines. I opted for vanilla bean powder out of ease, but a freshly scraped vanilla bean would be incredible (when is it not, though?). The chocolate ganache topping looks beautiful, and adds some fudgy richness to the cake. It’s not entirely necessary though – the vanilla bean cheesecake can shine all on it’s own. A topping of coconut whipped cream would also be amazing. The crust is also worth mentioning – it’s made with walnuts and almond flour, sweetened just as tad with dates, and spiced lightly with cinnamon and salt. A bit of coconut oil is also in there, helping hold things together. It’s nutty, a little crunchy, and perfect paired with the smooth vanilla bean cheesecake filling. 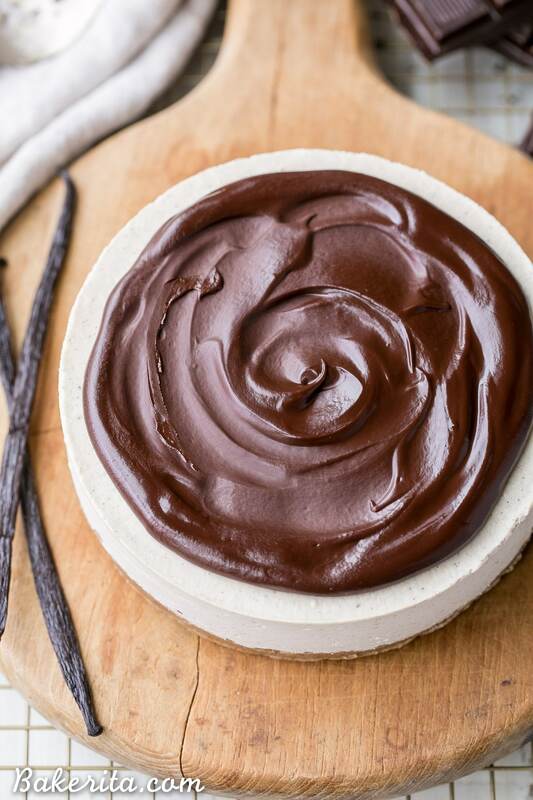 For those of you who like to keep it classic, this No-Bake Vanilla Bean Cheesecake with Chocolate Ganache is a certain winner. With the nutty crust, lusciously smooth and creamy vanilla bean filling, and rich chocolate ganache topping, it’s hard to resist. Just a small slice of this rich cheesecake will do the trick – enjoy! Grease a 6” springform pan with coconut oil, or line an 6” cake pan with strips of parchment paper for easy removal, and grease well with coconut oil. Set aside. Add the walnuts, almond flour, pitted dates, coconut oil, cinnamon and salt to a food processor or high-powered blender and pulverize until it comes together into a sort of sticky dough, with small walnut bits remaining. Don’t over process, or it’ll turn into nut butter! Press the date dough evenly along the bottom of the prepared pan. In the same food processor or high-powered blender (no need to wash between - I used my Vitamix, but most powerful blenders should do the job), combine all of the filling ingredients and blend for about 2 minutes, or until the mixture is silky smooth and creamy. Scrape down the sides as necessary. You may need to add a bit more coconut milk or lemon juice to get it to blend smoothly if your blender isn’t super high-powered. Once it’s smooth, taste the mixture and adjust the sweetness/tartness levels, if desired. Pour the filling into the prepared pan over the crust. Smooth out the top and tap the pan hard against the counter a few times to release any air bubbles. Place in the freezer. Place in the freezer to set for at least 3 hours or until completely firm before adding the chocolate ganache. 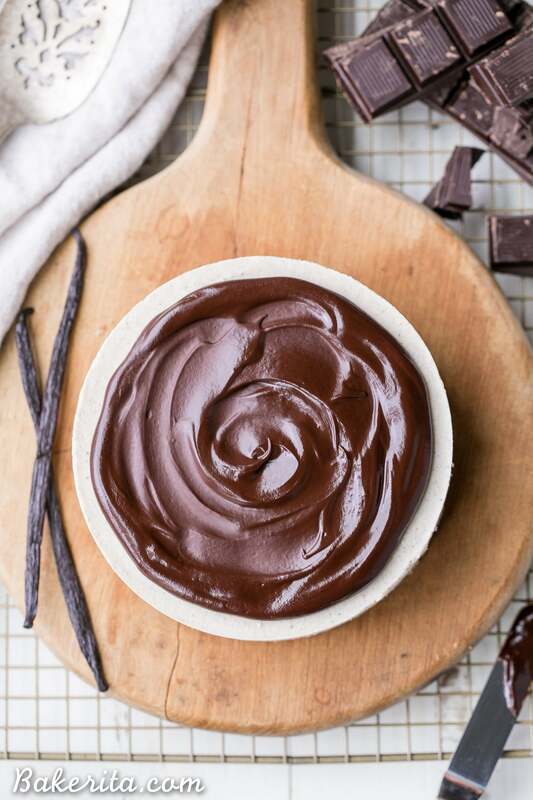 To make the ganache, place the chopped chocolate into a bowl. Warm the coconut milk in a saucepan until just simmering, and pour over the chocolate. You can also warm the coconut milk in the microwave for 30 seconds. Make sure the milk is covering all the chocolate and let stand for 2 minutes. Stir until smooth, and then spread over the cheesecake. Serve immediately, or place in the refrigerator or freezer until ready to serve. If storing in the freezer, let it thaw in the refrigerator for a few hours before serving or let thaw at room temperature for 15 minutes before serving. I recommend running your knife under hot water to warm it up before cutting the cheesecake with the still-hot (dried) knife. Store leftovers tightly wrapped in the freezer (3 months) or refrigerator (5 days). You can also cover the cashews in very hot/boiling water and let them sit for about an hour if you want to speed up the process - it won't be quite as creamy, but it will do the trick! I love cashew cheesecake- so creamy, easy to make, and stomach-friendly :) This is gorgeous- pinning! I love it so much too, Medha! Thanks so much for the love. Looks amazing!!! Do you happen to have the macros breakdown? I just updated the recipe to include them! You had me at Vanilla Bean! And ganache never hurts either ;) For as many raw vegan cheesecakes as I’ve made, the classic favorites remain my favorite. It’s time to make another! Classics are usually the best! Thanks so much, Ashley. Heaven. Pure heaven. I neeeeed a slice (or 5) of this in my life right now!! This recipe looks awesome! Cheesecake without dairy! I wondered however, if I could substitute the canned coconut milk for almond milk? My insides don’t get in well with coconut milk. Hi Misty, I haven’t tried it with any milk besides coconut milk. Almond milk should work, but the filling might be a little bit thinner since almond milk is much thicker than coconut milk. Maybe try reducing the amount to about 1/3 cup instead! I made this for 4th of July and it is delicious. I am not dairy or gluten free and was pleasantly surprised at how tasty cashew cheesecake is! I added a bit of lemon zest as well to the batter. Also used some berries on top of the ganache to add a little patriotic flare. For the crust, I only had black walnuts on hand and they were sooo good! The salty nutty crust is the perfect compliment to the creamy cheesecake. Excellent recipe! I’m so thrilled to hear that you enjoyed it Jill! Love the addition of lemon zest, and the berries on top. So much extra delicious freshness! The black walnuts sound tasty too. Thanks so much for your feedback! Could I double this and put it in a larger springform pan? Yes definitely! I’d recommend an 8″ or 10″ – it will be thicker in the 8″, or thinner in the 10″. Enjoy! Make this tonight…only had a regular blender because we are at a cottage for a vacation…it still worked and it was delicious. I did want to let people know, however, that mine was only about 1″ thick total. I didn’t see the 6″ springform pan and just brought my regular springform…not sure if it’s 9 or 10″. It actually was still a nice dessert after a big dinner, but was just surprised when I put it together how thin it was. For sure doubling or even tripling it would be necessary for a regular size springform. We will for sure make this again!! Even a SAD diet eater said it was delicious!! Thanks for your feedback, Colleen! I’m so glad you enjoyed it – sorry, for the pan confusion, though! I definitely recommend doubling when using a larger 9″ or 10″ pan. This looks delicious! Just wondering – in the ingredients section, next to the soaked cashews, it says See Notes. I can’t find any notes. Am I missing something? Hi Christi, it’s fixed now but it’s just a optional tip for the recipe, nothing you need to know! Hi! I made this last night and it’s got a caramel sort of colour! Is that because of the vanilla extract? Hi Nicole, that could definitely be why it turned out more caramel colored, since I used the vanilla bean flecks. Hi Raj, it will keep in the fridge for about 5 days, or in the freezer for up to 3 months (as long as it’s well wrapped). What could I use in place of vanilla bean powder? A scraped vanilla bean or vanilla extract will work! I made this today. I’m freezing it for Thanksgiving and making the ganache later. Thanks! Does it still hold it’s form at room temperature or does it have to be consumed frozen? Hi Sarah, I would let it thaw in the refrigerator before serving for the best texture. At room temperature for too long, it will get very soft. Hope this helps! Refined Coconut Oil | Expeller Pressed | Organic by Wilderness Family Natural is what I used. Followed the recipe exactly and even ordered the 6 in springform pan. Can i use reduced fat coconut milk? Hello Rachel, I made this cheesecake and left it in the fridge for two days. It never got firm. It remainded soft. It does taste great and I would like to make it again if I can figure out what I did wrong? Any idea? Hi Rosalba, sorry for your trouble – did you make any substitutions? The coconut oil should have helped it firm up nicely and I can’t imagine it wouldn’t have without it in there (unless you used processed liquid coconut oil). Let me know and I can help you figure out what happened! So glad I started following you on IG. Want to “wow” my sister who has recently turned to a plant based diet. She always hosts our large (35+) for Christmas dinner and I have been trying to find some sweet treats for her to include in my desserts (that’s my contribution to dinner) Now- to my question- it says “walnuts” but in the directions says “with small pecan pieces remaining”. Just curious- did you try with the pecans and then switched to walnuts? Taste or texture preference? Thanks!! Hi Mary! Thanks for following :) that was just a mistype on my part. I have made this crust with both, and it’s delicious both ways. The texture is very similar, so it comes down to which flavor you prefer. Either would work here. Enjoy, and I hope your sister and family love the desserts! Baking for the topping. Thanks? Is coconut cream in a can good to use or regular coconut milk I. A can . I and going to add raw dark chocolate chips to crust. Thanks. I made this once before in a 10 inch pan and made one chocolate layer use raw cocoa powder. You could probably swirl it. You could, but it would probably be pretty sweet. If you enjoy it though, then it will be fine! You can use either coconut milk or coconut cream, just make sure it’s full fat. Adding dark chocolate to the crust sounds delicious too, and I love the idea of a chocolate layer! Thanks for your comment Linda. I just made this cheesecake 3rd time today. I love it. Simple enough to make. We had a cheesecake Sunday at my church. I made this after people got over it was vegan and tried it they couldn’t believe it was vegan. Yay, that makes me so happy to hear! So glad that it was a hit at church, Tess :) thanks so much for sharing your feedback. Could I use 1/2 cup of peanuts? Hi Debora, I haven’t even tried this recipe with peanuts so I’m not sure how it would work out. It should be fine though, since the majority of your nuts are cashews. I’d love to hear how it turns out if you try it! Enjoy. What if I use regular coconut milk instead of canned one? Hi Nika – Canned coconut milk firms up, whereas coconut beverage doesn’t, so the cheesecake might not set up as firmly. I was planning on making this for a friends birthday. Would it be okay to be stored in a cooler for 4-5 hours with ice? Thank you and it looks delicious! Hi Emma, as long as it’s kept nice and cool it should be okay! :) Enjoy! Would melted vegan butter work instead of melted coconut oil? I haven’t tried it but I would think so – it might affect the flavor slightly though, so keep that in mind. Im thinking of making this recipe over the weekend and i have a quick question. How long do you soak the cashews for? Other recipes that i have seen only soak for a few hours whilst you said overnight, i am just a bit unsure. Hi Ella, you can do it a minimum of 4 hours but I find it gets creamier when you let them soak 8-10 hours. Hope this helps! This was absolutely delicious! It got better and better day two and three. I will be making this again for sure! Would any nuts work for the crust? I seem to be a bit sensitive to the walnuts and curious what type of nut you would recommend in its place. Hi Nikky, so glad you’re loving it! Any nut will do for the crust – pecans or almonds would be great, or whatever your favorite is. Enjoy! Would it be possible to sub something else for the coconut oil? You could use melted cacao butter! 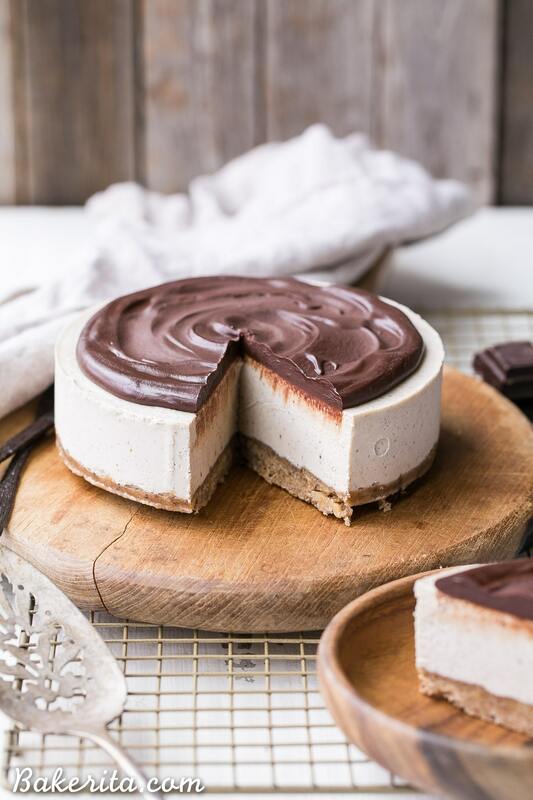 Hi, I am not vegan but I really like the Graham cracker base recipe..can I use it with the usual dairy cheesecakes recipe or any kind of moose? Yup, that should be fine! I’ve never tried baking it though, so not sure how that would work. I’m new to cashew cheesecakes, and only have roasted, salted cashews on hand. Will they work as well, or must cashews be raw? I haven’t ever tried with roasted salted cashews – they’re drier than raw cashews so it will probably not get as creamy, the color will be darker, and it will have a lot of extra salt. But it would probably work! Wouldn’t be the same, though. I am unfortunately allergic to coconut. (And bananas…hard being a vegan with a sweet tooth haha) Can I use nut milk instead of coconut? And is there something you’d recommend to sub for the coconut oil? I haven’t had cheesecake in soooooo long!! Hi Rachel, yes you can use nut milk instead, and I’d recommend using cacao butter instead of the coconut oil! They’re pretty essential to getting the crust to stick together – you could try another sticky dried fruit, like prunes or figs, but I’d soak them in hot water first to soften them up! Hi K, you soak in water. Wow, this cheesecake looks absolutely amazing, such a luscious texture and the chocolate ganache looks almost too beautiful to eat! Hi! Could i leave the cheesecake out in a cool environment (with A/c) for about 5hrs? or would it melt? Hi Ana, I don’t think it would melt completely but it definitely would get pretty soft – I wouldn’t recommend it for the best results! Could I use almonds instead of cashews? I am thinking carb content since I am doing keto. Also, can a sugar substitute be used instead of the maple syrup? I don’t think almonds would blend the same way the cashews do here, since they aren’t as creamy and the skins wouldn make it not as smooth. I don’t use or recommend sugar substitutes since they’re generally so artificial, but I would imagine you could use a sugar free maple syrup or maybe some stevia and it would work.